Why should I play at the Palace of Chance? Palace of Chance offers a variety of new player welcome bonuses and bonus codes. We’ve hand picked the best Palace of Chance coupon codes to choose from. Among the most popular is the $100 free chip, no deposit necessary. Redeem the coupon code AUTUMN100 to receive this offer! Click here to receive your free $100 chip from Palace of Chance! No deposit required! Consult all our recommended Palace of Chance promo codes below. NEVERENDING200 200% No Rules, No Limit Sign up Bonus + Matching Chip if You Lose No Wagering Requirements - Slots, Keno, Bingo, and Scratch Cards only. No Max Cash-Out. Min deposit only $30. USAFREE 200% No Rules Slots Bonus + 25 Free Spins No Wagering Requirements on Slots (60x for Table games and Video Poker). No Max Cash-Out - will redeem with any deposit you make of $50 or more. AUTUMN100 $100 Free Chip - No Deposit Bonus 30x Wagering Requirement (60x for Table Games and Video Poker), and $100 Minimum/Maximum Allowed Cash-Out. CASHABLE no deposit bonus! PIRATE88 $88 Free Chip - No Deposit Bonus 30x Wagering Requirement (Slots & Keno Only), and $100 Minimum/Maximum Allowed Cash-Out. CASHABLE no deposit bonus! The Palace of Chance Casino offers a lot of variety on their welcome bonuses. The welcome bonus you receive as a new player will depend on the coupon code you redeem. There are too many of those to explain all of them, but we will highlight the best coupon codes to consider and how they work. Some of these coupon codes and bonuses are not advertised anywhere! The most notable point about the Palace of Chance is that they offer CASHABLE no deposit bonuses. This is extremely rare. They will give you a free chip and allow you to withdraw it once you’ve met the wagering requirements! Our top recommendation is the AUTUMN100 bonus code which delivers a $100 no deposit bonus. Read on! Because you can’t pass up a killer casino bonus, and Palace of Chance has several. We’ll guide you through them! And to start, you can receive a $100 FREE CHIP! The free chip is CASHABLE! Additionally, Palace of Chance offers a never-ending reload bonus of 200% as well, so you can continue to play at Palace of Change and take advantage of ongoing bonuses. Palace of Chance Casino offers new players several no deposit bonuses as well as deposit bonuses. We’re going to cut to the chase and just recommend the best ones. You are only allowed to redeem one no deposit bonus coupon code before having to make a real money deposit. So start off with this one below! Redeem the Coupon Code AUTUMN100 and receive a $100 Free Casino Chip! The $100 free chip is CASHABLE once you’ve met the wagering requirements! There is a 30x wagering requirement on this bonus and you may only play Slots, Keno, Scratchcards, and Bonus Bingo. There is a maximum withdrawal amount of $100. Players cannot process a withdrawal until after the wagering requirements are met! Click here to receive your free $100 no deposit bonus! After you’ve redeemed the AUTUMN100 coupon code, you’ll have to make a real money deposit. For a deposit bonus, we recommend redeeming the NEVERENDING200 bonus code. Take advantage of the 200% never ending reload bonus. What sets this bonus apart from other welcome promotions is that it is available to the player on every deposit. In other words, if you want to make a deposit every day of the month, then you can take advantage of the 200-percent no-limit “signup” bonus and 100-percent match free chip on a loss every day of the month as well. Redeem the Coupon Code NEVERENDING200 and receive a 200% match on any deposit over $30. There is a 15x wagering requirement on the sum of the deposit and bonus amounts. Make your deposit with a debit or credit card, depositing via Moneybookers or Neteller voids the promotion! Also get a 100% matching chip if you lose. Deposit $100, and if you lose it, you’ll receive a $100 free chip in ADDITION to the 200% deposit bonus! There is no maximum cashout limitation! We recommend only playing Slots, Keno, or Scratch Cards for this bonus. Playing Craps, Roulette, Baccarat, Pontoon 21, War, Sic Bo and Pai Gow Poker will void all your winnings! The bonus is “sticky” and cannot be withdrawn, but your winnings can be withdrawn. Click here to redeem the NEVERENDING200 coupon code! After making your first deposit, you can now take part in another free chip or no deposit bonus offer. Here we recommend the bonus code advertised on the Palace of Chance website. Redeem the coupon code PIRATE88 next! 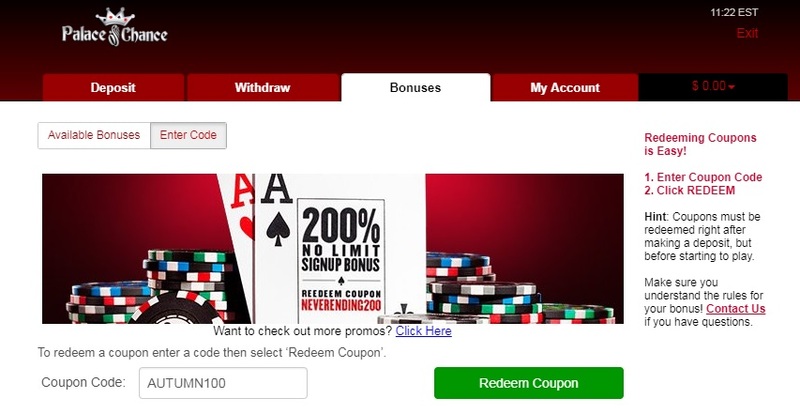 Redeem the Coupon Code PIRATE88 and receive a $88 no deposit bonus free chip. The $88 free chip is CASHABLE once you’ve met the wagering requirements! Click here to redeem the PIRATE88 coupon code! The Palace of Chance casino requires users to download and install a Windows desktop client. To register, first navigate to the Palace of Chance website, click the large yellow Download Casino button and then follow the instructions. Once installed, the casino program will walk you through registering a casino account, setting up a banking account and making a deposit. If you need help, you can telephone or chat support, and a representative can walk you through downloading, installation and all phases of account registration. Claiming bonuses at Palace of Chance requires you to use coupon codes, which can be done from within the Cashier under the Redeem Coupon tab. You can combine certain eligible codes, and that is what must be done here to claim both the signup bonus and the free chip. The code for the reload bonus is NEVERENDING200, and the code for the $100 free chip is AUTUMN100. The 100-percent match free chip that is awarded to the player who loses his or her deposit is automatic when using the NEVERENDING200 coupon. The minimum deposit at Palace of Chance is $30. Palace of Chance has few rules in place for bonus usability. The one rule to be aware of is restricted games, which are Baccarat, Craps, Pontoon 21, Pai Gow Poker, Roulette, Sic Bo and War. Playing these restricted games will void any and all winnings derived from the bonus, so avoid them. Note that while Blackjack and Video Poker are not always restricted games, they are for the purposes of this deposit bonus but not necessarily for the free chip, which would matter if that were claimed alone. All wagering requirements must be met in order to cash out. Cashing out early can result in voiding of the entire promotion. Deposit bonuses are not cashable and will be removed upon withdrawal. Note that free chips are cashable and thus not removed. The standard wagering requirement at Palace of Chance is 15 times the deposit and the bonus amount. Free chips are a special case and require a 20 times rollover instead. Additionally, the NEVERENDING200 free chip limits winnings derived from it to $100. Few online casinos offer an unlimited deposit bonus, but that is essentially what is available here. All Palace of Chance clients can in effect double their bankrolls, and that is particularly lucrative to the high roller. Constantly claiming bonuses does put one in an endless cycle of obligation, but the high-stakes player has the bankroll to break that cycle even if they cannot hit the big jackpot that makes it all a moot point anyway. Click here to visit the Palace of Chance Casino! Get your $100 no deposit bonus! We highly recommend the no deposit bonus available at SlotoCash. Read our review of the SlotoCash bonus codes here. We also like the Planet 7 Casino where you can get a $85 free chip with no deposit necessary! Read a review of the Planet 7 Casino no deposit bonus code here! There's a new code for the $100 free chip - use AUTUMN100 - worked fine! Never heard of a no deposit bonus where you could withdraw the free chip if you're lucky enough to hold on to it after playing thru the requirements!! Good luck y'all. Thank you, tried your EMPIRE100 code and it totally worked, receive my $100 free chip and I did not have to make a deposit to receive it. Very cool! Lots of games, I would recommend downloading the software rather than playing the flash games.